Entering day 3 of Seattle Beer Week, I’m feeling good and ready for more. It’s a beautiful day here in Seattle, and even though I’m not planning on going anywhere till later (Elysian Beer Fest & Collins Ninkasi Dinner), I’m ready for a beer on the porch. I’m trying to talk myself out of it…we’ll see. Things started off with a bang Thursday night at Pike, with a ceremonial reading of the mayor’s proclamation officially declaring this Seattle Beer Week. 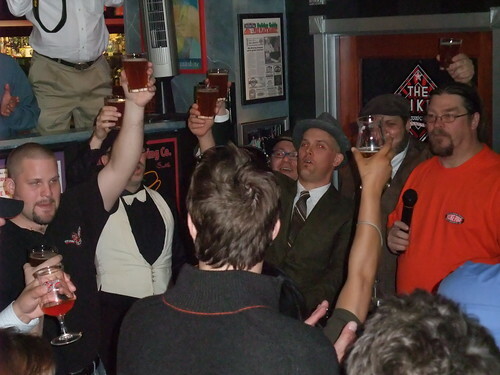 The first cask of the commemorative Pike Double IPA was then tapped by Drew Cluley, and the crowd joined the Seattle Beer Collective (the guys responsible for this 10 day long party) in raising a glass. There was a nice mix of familiar faces from the industry, as well as plenty of folks who just love a good beer. 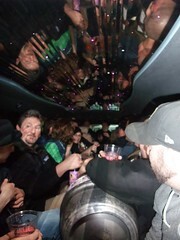 From Pike, it was off in the biggest limo I’ve ever been in with about 24 other people to take a ride over to Beveridge Place for Part II of the kickoff. They rolled out the red carpet for our delivery of the cask of Pike Double IPA to be tapped at BPP, and things were already in full swing upon arrival. BPP had a bunch of casks going, including the Elliott Bay Bourbon Barrel Imperial Stout and a Sour Mango Ale from Trade Route/Laughing Buddha. The Sour Mango might not usually be my thing, but after a couple pints of the Pike Double IPA, it was light and refreshing and really hit the spot. After a couple of hours at BPP, the celebrations continued up at The Dray, but I opted for a bus ride home (yeah, a bit of a step down from how I arrived…) and a good night’s sleep. On Friday, we rolled into Fremont around 5:30pm and came into an already packed Brouwer’s for their “Back in Black” Stout Night. We snagged one of the last open tables and ordered a round of Founders Canadian Breakfast Stout Aged in Bourbon Maple Barrels, Stone Bourbon Barrel Imperial Russian Stout, and Stone Bourbon Barrel 12th Anniversary Bitter Chocolate Stout. Yeah – not a bad freaking round of beers, huh? The Founders was an easy highlight of the night. The Stone Impy was a monster of a good BA beer, and the 12th Anniversry was heavy on the bourbon for those that swing that way. Next up was a round of Lost Abbey Serpent Stout, Full Sail Black Gold 09, Great Divide Espresso Yeti, and Stoudts Fat Dog Imperial Stout. The Black Gold & Espresso Yeti were both fantastic, the Lost Abbey was good but a bit heavy for me at that point, and the Stoudt’s made me wonder if the keg suffered on its long trip from out East. It was a hell of a lineup of beers, and there were several more I would have liked to have tried…but we had to get our butts up to Naked City & their “Ale of Two Cities” release. We had heard that the monthly Phinney/Greenwood Art Walk was going on the same night as the “Ale of Two Cities” release, and we were prepared for the massive crowd huddled into Naked City. Even with a crowd that size, it was still fairly easy to creep your way up to the bar and grab a beer. The Naked City/Silver City Hoptrocity (9% ABV) was even better than I remember it from when they brewed a batch at Stix way back when. The Anacortes/Silver City Eau Sombre (8.5% ABV) was a Belgian-style strong dark ale that was enjoyable, and will definitely smooth out and improve with age (if they have more). All us beer geeks were also excited to hear that the Don’s had picked up some special kegs from breweries around eastern/southern WA that don’t usually send their beer out to Seattle. In particular, they had a keg of the Yakima Craft Brewing IPA that just received an “A+” rating from BeerAdvocate magazine. Located out in the middle of hop country, this was a very solid session IPA with lots of hop flavor and a long bitterness. I’d love to try it again…say, maybe before drinking a bunch of stouts:-) The Hazel Dell Imperial IPA was a definite highlight for me as well at Naked City. We got out of there before too long in order to save ourselves for today; but not before stopping by Kau Kaufor what’s become my favorite asian BBQ pork in the ID. So far, 2 great nights and zero hangovers. Booya. There’s lots going on tonight…I’ll be headed to the Great Elysian Beer Fest (over 40 beers; all from Elysian! ), and then over to Collins Pub for the Ninkasi brewers dinner. It was very tempting to hop on the bus for the Northern Washington Brewery Tour, but I just couldn’t leave town. Head over to the events page at the SBW website for a full list of what’s going on. You can click on any of the posted photos to see my entire set of Seattle Beer Week photos, which I’ll continue to update throughout the week. 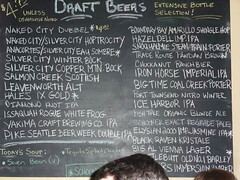 Draft board at Naked City for the "Ale of Two Cities" release night. great report on an embarrassment of beer riches, Geoff! The Yakima Craft Brewing IPA sounds interesting …can’t wait to try it. yeah, any review on the yakima IPA?